Most roof damage in the Dallas/Fort Worth area is caused by storms—more specifically, by hail. If your roof has been exposed to severe weather, the roof (and therefore your safety) could be compromised. Many homeowners do not realize that even small hail can compromise your roof's integrity, so be sure to have your roof inspected if you think damage may have occurred. The good news? The inspection is free ! Missing areas of granules on shingles. Gutters, swimming pools, or areas under eaves that are covered with (or are full of) granules. 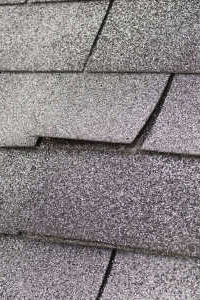 The impact from hail can remove and fracture the granule surface material that covers shingles. Granules protect the asphalt from sunlight and ultraviolet (UV) light. Once exposed to the sun, asphalt will deteriorate quickly. Any accelerated granule loss will significantly reduce the life of a shingle. It has been expressed that there is 25% more granules on a shingle than is needed. This is not true. Some granules are not actually embedded in the asphalt when the shingle is produced and come off in the first year after application. After the first year, the shingle does not carry any more granules than are necessary to protect the shingle for intended life expectancy. Roof damage may be obvious —especially after large storms with large hail, or storms that hail for extended periods of time—or it may not be so obvious. In fact, granule surface loosening will not usually show up as visual damage right away. But it will cause the shingles to deteriorate at an accelerated rate, leading to premature roof failure.